The 5,600-tonne north approach viaduct of the Queensferry Crossing has been fully launched in what has been called “one of the most technically challenging operations of its type ever performed”. Latest updates have confirmed the project is on time and due to come in under its fixed budget range of £1.325 to £1.35 billion and is due to open to traffic in December. 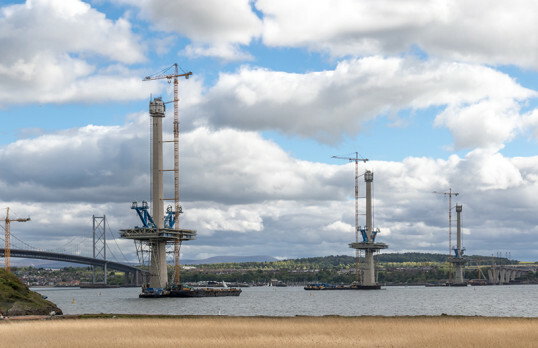 Describing the latest milestone, Michael Martin, project director for the Forth Crossing Bridge Constructors consortium, said: “This is the kind of work being delivered on a daily basis right across this amazing project. A massive total of 6,300 tonnes of steel and concrete was launched out 230 metres, in itself a significant feat of engineering. Around 48 miles of cables were used to complete the launch and unlike its south counterpart which was constructed in sections, the north viaduct was fully assembled on site and pushed out over static temporary supports as a single operation. As well as being pushed out, the viaduct was rotated and pivoted upwards making sure that it rolled over the top of the piers. Only 64 metres now lie between making the connection from the north viaduct to the north deck fan. Click here for time-lapse and drone footage of the launch.